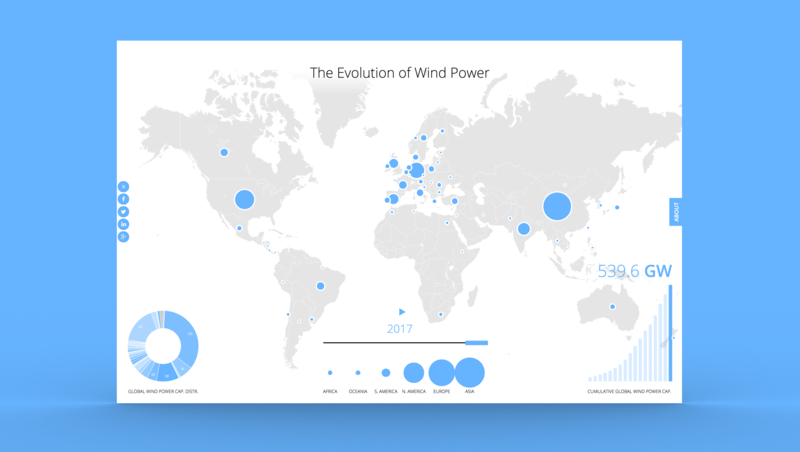 The Evolution of Wind Power is the result of a cooperation between The Global Wind Energy Council (GWEC) and renewable energy software company Greenbyte. The interactive map reveals the cumulative installed capacity per country, continent and the world between 1981-2018. Let’s take a closer look at the figures and see what has happened in the past twelve months. China continues its incredible growth and has added an additional 19,500 MW of fresh wind in 2017. With 188,232 MW installed capacity, China remains the world’s largest regional market for new wind power development. This year again, Pakistan almost doubled its installed wind power capacity, bringing it to 792 MW in total. Another fast-moving Asian country is Thailand—with a 50% increase in installed capacity from last year, Thailand had some of the most impressive growth in 2017 and has now reached a total capacity of 648 MW. The UK had an excellent year with 4270 MW installed in 2017—an increase of about 30% from the previous year. Their Irish neighbor also had wind in its sails, reaching 3127 MW of installed capacity, i.e. a 16% increase from 2016. 2017 was also a great year for Latin America. Brazil had an excellent year in 2016, adding 2GW, and still managed to add an another 2GW this year, reaching a total of 12,763 MW. Chile and Honduras both grew their installed wind power capacity by more than 25%. Established wind power nations Germany and the USA have kept a steady growth rate with about 10% new capacity added in 2017 each. Other countries that experienced significant growth in installed wind power capacity last year were: Belgium up 20% to 2843 MW, India up 15% to 32,848 MW and France up 14% to 13,759 MW.